November 3, 2017 (HOUSTON, TX) – Houston-based commercial real estate firm, Boxer Property, is pleased it has concluded lease renewal and expansion negotiations with the Texas Facilities Commission, a Texas state agency in charge of managing the state’s government buildings. 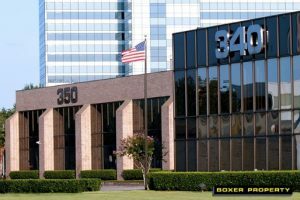 Texas Facilities Commission has been a valued Boxer Property tenant for many years and has expanded their space to 14,651 square feet at 350 N Sam Houston Parkway E in Houston, TX. Trey Miller, Senior Broker, negotiated the renewal and expansion on behalf of Boxer Property and worked directly with the tenant to complete the deal. 340 and 350 North Sam Houston Parkway East, located in the North Houston District, together feature 172,969 square feet of office space for rent. The 2-story properties offer ample garage parking, floor-to-ceiling windows, lush landscaping and garden lobbies with koi ponds, and on-site maintenance and management services. Originally founded in 1919 as the State of Board Control, the Texas Facilities Commission’s (TFC) main duty is to manage state government buildings. The state agency is also responsible for handling the sale of surplus property as well as managing the Federal Surplus Program for the state of Texas and qualified local, non-profit agencies. The TFC’s main headquarters in located in Austin, TX. For more information visit www.tfc.state.tx.us.